The Garage Spa has a fascinating past, transformed from an ancient stopping station into a modern spa. Today it’s part of the historic Morritt Country House Hotel and embraces its background by offering quirky themed names for spa facilities and services. The spa has both indoor and outdoor hot tubs, a steam room, salt inhalation room and a hammam. Treatments by Germaine de Capuccini and Caci sit alongside Jessica manicures and pedicures, beauty treatments and alternative therapies. The Garage Spa is what it says on the tin: a former garage which has been converted into a decidedly different spa. It's off the beaten track, next door to The Morritt Country House Hotel; this is where you will stay if you are on an overnight spa break. The Garage is a brick building with a fascinating past as a stopping station on the road from London to Carlisle. Now, it's a small spa with a garden that offers a chance for modern travellers to rest and unwind. As the spa takes a maximum of twenty guests at any one time, you won't feel crowded. In recognition of the Garage's former purpose, many parts of the spa are named accordingly. So, spa reception is called The Forecourt. Immediately behind The Forecourt is the Relaxation Lounge. This area has comfortable armchairs where you can fill in your consultation form or relax with a hot or cold drink. This is all about old-fashioned relaxation with an open fire in warmer weather. The Paint Room, directly off the lounge, offers manicures and pedicures as well as haircuts and styling. As you enter the spa with its low-hanging metal lights and grey tiles, the atmosphere changes completely. The changing rooms are a delight. There are no communal changing areas; instead, seven private changing rooms each have their own shower and sink. A wooden bench lifts up to reveal a loo on one side. In your locker in the corridor is your robe, flip-flops and a small bottle of hair conditioner. The first thermal experience is the salt relaxation room, which has reclined chairs. The temperature is ambient so most guests stay in their robes and gaze at the changing colours of the salt bricks in the wall. The steam room is large and nicely steamy. If you need to cool down, you also have the Car Wash: an open-plan block of four showers including a cold douse and a bucket shower. You can also rehydrate from jugs of water with cucumber or relax in the hanging pod chairs. 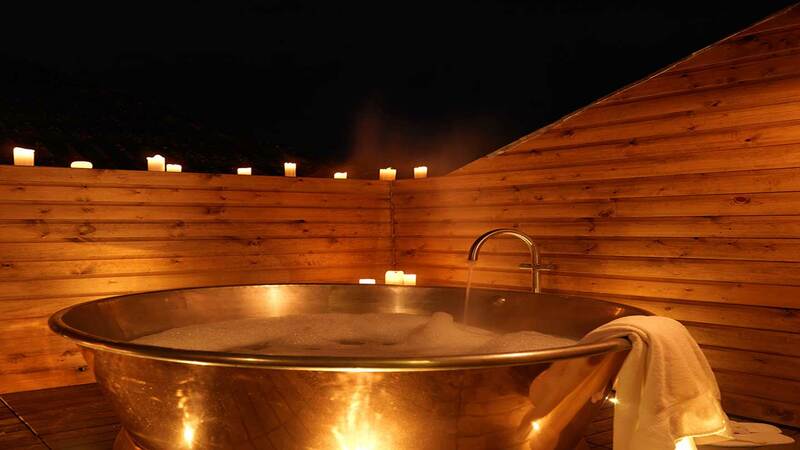 Three wooden tubs provide a thermal treat: one is warm and one hot; you can bubble away under multiple low-hanging car-inspection lamps (a possible first in a spa). The third is a cold tub which you can use as a plunge pool after any of the heat experiences. Outside, the Secret Garden has more spa treats. The Shepherd's Hut converted into a sauna was extremely toasty in our visit. There is also a fireplace built into the wall under an overhanging roof. The roof also shelters the hydro-pool which is a large copper bath, and a Jacuzzi. Plenty of loungers are out here for warmer weather, some around a fire pit for chillier days. Back inside, the treatment rooms are upstairs, with a suite for couples called The Rolls Royce. The Whispering Lounge is also upstairs; this space with four beds and a couple of chairs is where you wait for your treatments and relax afterwards. There is a lift for those unable to use the stairs. We visited the spa on one of their "MOT" day-spa packages, which includes access to the spa facilities, a two-course lunch, and a 50-minute treatment for £99. We chose the combined Baobab Scalp Massage and a Taste of Germaine Facial for our treatment -- and a delightful treatment it was, too. Michelle, my therapist, took me through to a quiet treatment room decorated in neutral tones. As with all Germaine De Cappucini treatments, we started with a foot cleanse, which is always a gentle way to ease into a treatment. Michelle gave me a thorough neck and scalp massage using ethically sourced baobab-seed oil, which felt both smooth and nourishing. I particularly enjoyed the pressure-point massage on my scalp, and the neck rolls and stretches that loosened my tight muscles. The facial involved a double cleanse, an exfoliator that Michelle removed with warm mitts and lots of concentrated facial massage that really soothed my skin. Michelle noticed the tension in my jaw line and expertly worked her way around it. The treatment ended with a spritz of Mediterranean citrusy scent to bring me back to the world. The facial and massage combined meant I left the room with a lot of my tension lifted. A highly effective combination, and one I recommend. The next day, I was back with Michelle for the Holistic Stress Buster (40 minutes, £40). Michelle started with me lying face down on the treatment bed; she walked warmed herb cushions around my body to ground me. A back exfoliation followed, which left my skin soft and smooth. She then massaged what she called my "killer knots" into some sort of tameness. The phyto-oil felt soft on my skin and when Michelle walked her hands around my body to end the treatment, I was disappointed it was going to be over. A proper massage, with my stress seriously addressed. The facials on offer at The Garage Spa concentrate on anti-ageing from Germaine De Cappucini and CACI. You can also try a variety of massages, scrubs, wraps, or the rasul or hammam. The Garage Spa also offers manicures, pedicures, and beauty finishing touches such as spray tanning and waxing. The menu has treatments for men and mums-to-be, too, as well as dry floatation. If you are on a day package at The Garage Spa, you'll eat lunch or afternoon tea in Gilroy’s Restaurant, a few steps across the garden in the main hotel. You can dine in your robe in a separate area of the room. If the weather is warmer, you could also dine outside at the tables in front of the spa. Our lunch choices included a "risotto of the moment" with rocket and parmesan, soup, and smoked Highland salmon and prawns. Our baked mushroom starter was delicious but, with garlic and cream, quite rich for a spa day. The mains are mainly comfort food, too, such as omelette and fries, sausage and mash and a ploughman's. You can choose a caesar salad, though, and our cod en papillote was light and fresh. If you like your spa day to include a sticky toffee pudding, you know where to go. You can order soft drinks, wine, beers and cider in the spa, so you can certainly add a sparkle to your spa day. The sheer inventiveness and individuality of The Garage Spa. This is a spa with a vision and the confidence to pull it off. The Garage Spa has managed to fit so many facilities into quite a small space. There is no lap pool, but every nook and cranny offers up something new. Our treatments: Sometimes a proper massage is what you want, and this is what we got. Not having somewhere to lie down after our treatment. The Whispering Lounge is comfortable but bright, and has people passing through on their way to treatments. Anyone who enjoys thermal facilities and relaxation over a swim and the gym. Anyone looking to convert a reluctant male to the joys of spa-ing: the garage theme and masculine décor will ensure that he feels on safe ground. 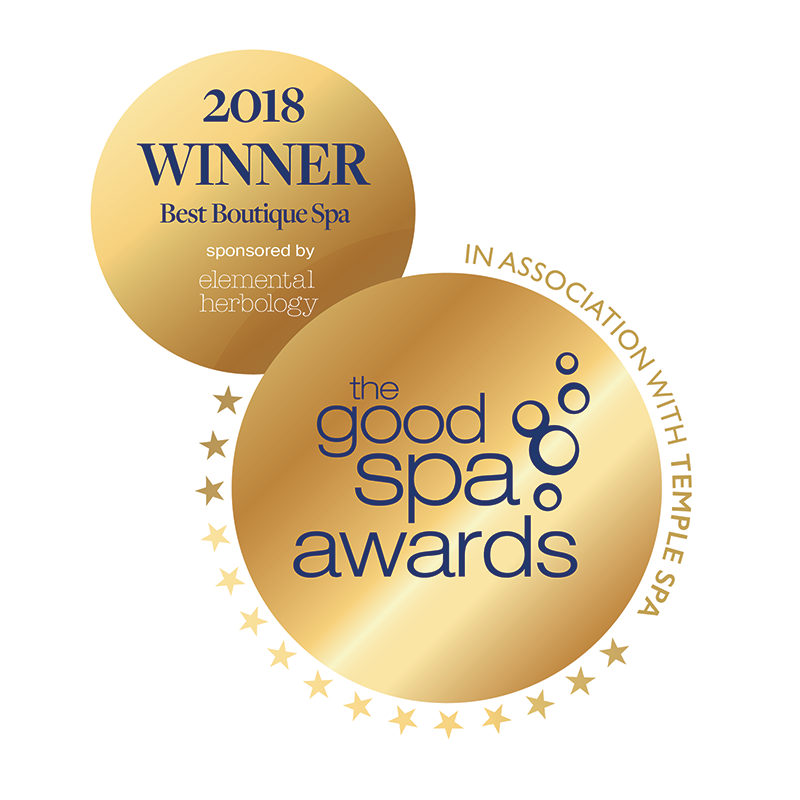 We awarded The Garage Spa a Good Spa Guide Bubble rating of 5 bubbles. The Garage stands out for its quirky and cool design, varied facilities, excellent treatments and helpful customer service. A spa worth travelling to. Single Spy visited in June 2018 and awarded it 5 Bubbles. "Pros Great food Great facilities Lovely decor Clean Friendly and professional staff Amazing massage Lovely garden Cons No swimming pool Not many places to sit "
"Quirky, different, stylish a definite one of a kind spa. Lovely courtyard garden to sit out in when it’s sunny. It’s like a little mini discovery cove where you wonder what’s round the corner. " "This spa is a little treasure it’s self and not forgetting the staff, what a beautiful safe haven for anyone looking for a relaxing day. I can’t recommend enough the salt room it’s fantastic and sure I feel asleep in there for a few minutes, the garage spa has five bubbles but in my opinion it’s above and beyond. If you have the chance please go and treat yourself you won’t be disappointed. " The Morritt Hotel and Garage Spa has a range of options in order to exceed everyone’s expectations. The 2 Rosette Award winning Gilroy’s Dining Room offers seasonal produce with a contempory twist, and in contrast The Dickens Bar offers classic dishes cooked in a homely fashion. They also offer Afternoon Tea, light snacks and al fresco dining. The Morritt Hotel and Garage Spa has a wide variety of room types and styles to suit all needs and tastes. Classic double/twins, family, deluxe and executive make up the 26 room collection. They also have an adapted room with special facilities, in order to offer everyone the opportunity to join us and enjoy themselves. 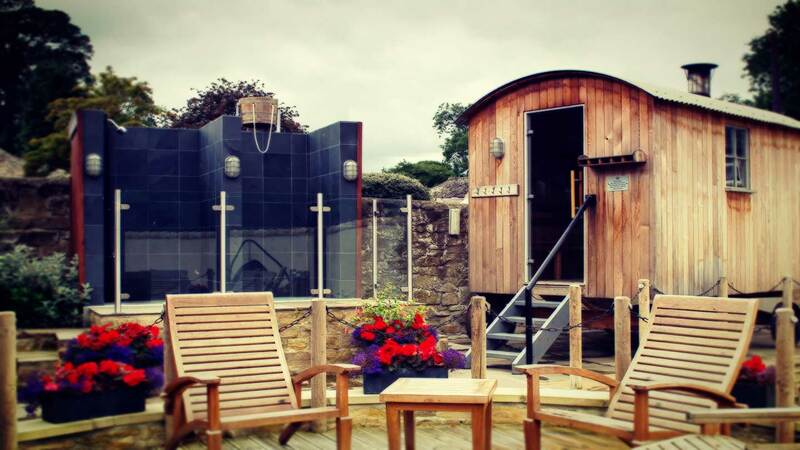 In addition to the hotel accommodation they have a self catering holiday cottage that sleeps 20 people and includes its own hot tub and sauna, perfect for a hen do celebration or family staycation. Please note some of the bedrooms are away from the main building and there is also no lift, so if you have any special requests please call ahead in advance. The Accessible bedroom 'Matilda' -- Room 43 -- is situated on the ground floor and is accessible straight from the car park. It has widened door frames, grab rails in the bathroom and specially designed walk in shower.